End of days skies loomed ominously over the apartments ahead as I hurriedly left work. The first roll of thunder was all the motivation I had needed to drop everything and head home; I figured I had a ten-minute window before the heavens opened for the daily downpour. As I crossed the car park a clap of thunder exploded directly above me, reverberating through me like a shock. The crack was so violent I actually looked around to see if anything had exploded or if a shotgun was near by. I didn’t think my heart rate or hearing would ever be the same again as I hastened my steps. Warm winds whipped around me, occasionally mixed with a shock of cold air that froze the sweat on my brow. Above me the sky was still blue, behind me the thunder growled again, and ahead the skies lowered angrily. Just as I passed under some power lines I saw the first shard of lightening flicker off to my right. I tried to move faster through the humid, choking air, closing my eyes to the dusty wind and listening apprehensively to the low whistle of approaching rain. Just as I reached the lobby of my apartment the first fat drops descended, quickly followed by never ending strings of tropical rain. I’d made it! 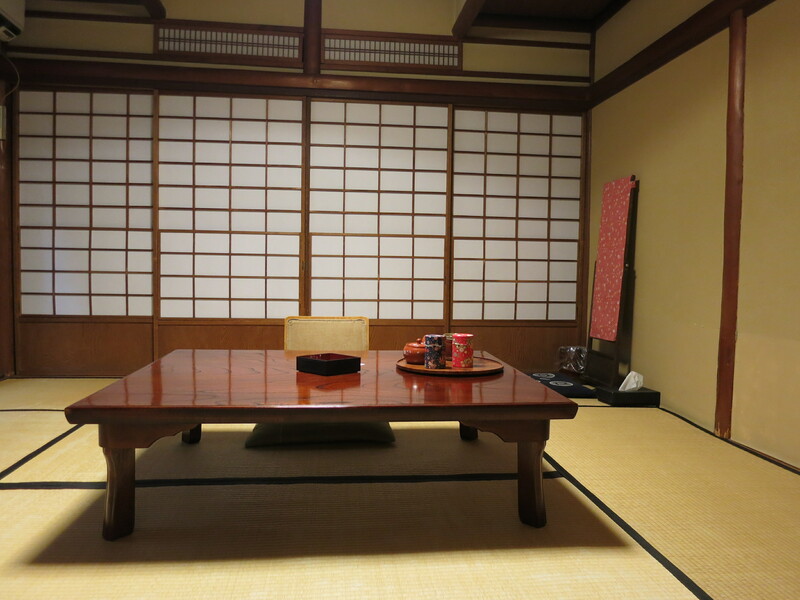 I sat, crossed legged, on a thin cotton cushion in shades of green that echoed the trees on the mountain outside; on a tatami rush floor; writing my blog at a low wooden table, with a Japanese tea set to my left. My walls were wood and paper; all my doors and windows were sliding, and my bed, when I made it, was a futon on the floor. I was wrapped in an enormous cotton yukata (an informal kimono) which reminded me of beech bark and blossom. All I could hear was the rush of the stream directly outside my window. Staying in one of the oldest spa ryokans in Hakone was a relaxing experience. Ichinoyu Honkan was founded in 1630 in the Edo period when Tokugawa Shoguns ruled Japan. The Hakone area was a popular resting post for warriors, where they could relax in natural spring waters to recuperate after battle. This particular ryokan has its own onsen hot springs to relax in, which were great after a day exploring the Hakone National Park. The Japanese onsen experience is very relaxing when you know what you’re doing but for a first timer it is fraught with potential dangers. The etiquette of communal bathing is a minefield of offence for the uninitiated, although I find it’s ritualistic nature quite soothing. Traditional onsen are communal. Years of playing hockey and going to the gym have made me immune to any embarrassment about nakedness in communal facilities. In fact, as a child I was nicknamed ‘the nutty nudist’ because I’d take my swimming costume off to go paddling at the beach! While I was aware of sideways glances, I like to think the locals were evaluating my mismatched tan lines rather than judging my muffin roll! The correct way to then use these facilities is to rinse yourself off with warm water away from the main spa, as it is only polite, and hygienic, to rinse yourself off before entering the pure waters. Then, you can soak in the spring-fed tub for as long as you like (the water is hot and only bearable for a relatively short time) soothing way the day’s stresses and strains. Don’t ‘wash’ in the spring though. Save that for your return to the washing area, where you can avail yourself of the soaps and shampoos provided and scrub yourself down while sitting on a low wooden stool, being careful not to splash others in the process. Then, you can return to the spa tub for a further soak. (In the second ryokan I stayed in they had an outdoor tub that I made very good use of!) When you have had enough relaxation, gazing at the mountain scenery or listening to the hypnotic flow of the spring water, remove yourself from the spa area, wipe yourself down so you do not reenter the changing area sopping wet, and you’re done! I think I got it right! The best way to learn is to do what the locals do but in an onsen I can’t sit and watch without considerable discomfort to all! Side glances in windows and carefull listening whilst averting ones eyes allowed me a sense of what to do, and often, I’d have the place to myself so I could just relax and enjoy it without causing offence. The almost ritualistic nature of the experience means that, if you do it properly, it is quite time consuming and hypnotic. I find the same can be said when tackling traditional Japanese meals. 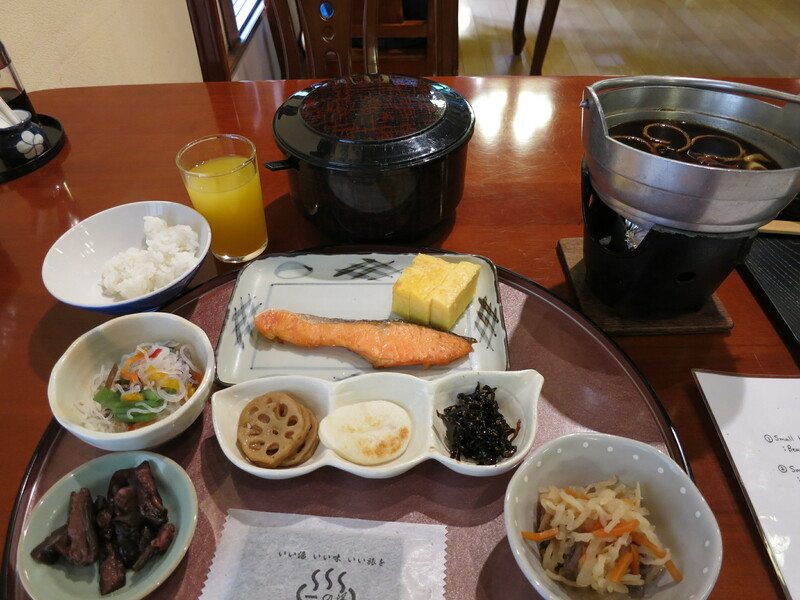 Some of the best food I ate was made at the ryokan I stayed in. And I can safely say that I have never been so full on what appears (at first) to be such small servings of food. Often I would spend a full 30 minutes steadily grazing from the ever increasing range of tiny dishes placed before me, forcing myself to think about what I was eating and therefore enjoy it all the more. It almost became a meditation that brought me great satisfaction. 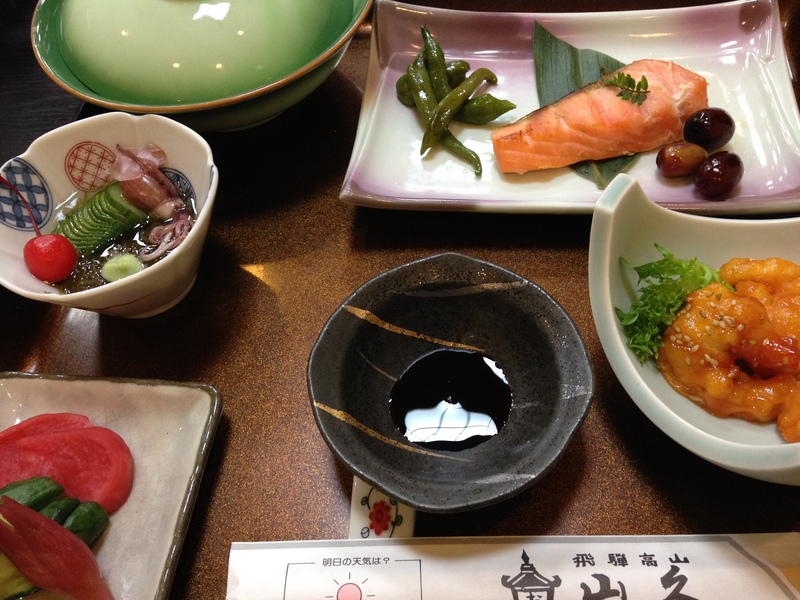 A traditional Japanese meal is a bit like tapas, in that there are lots of tasty morsels on lots of different plates, spread out across the meal. 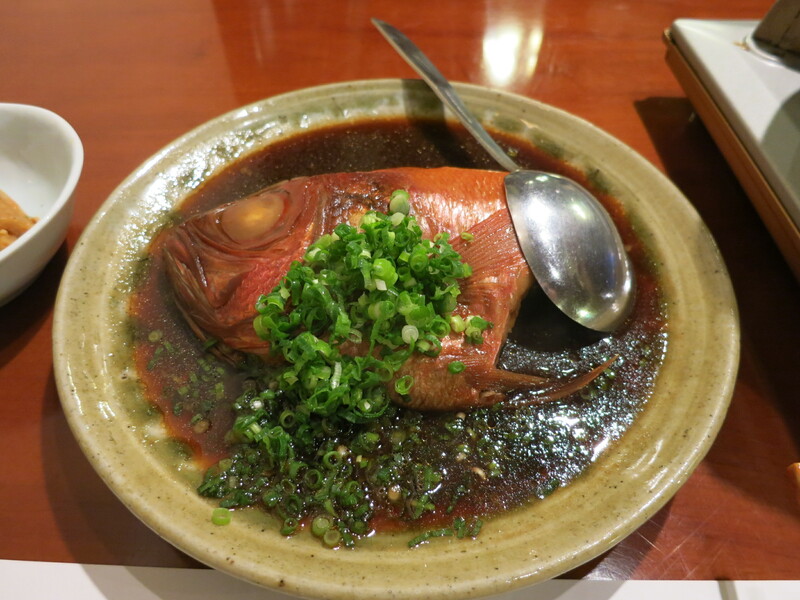 The difference is that a lot of it is raw, steamed or lightly fried, it can all be eaten with rice and at least one dish is cooked in a small pot on the table, simmering away until the tea light beneath it goes out and steam is rising from the lid. As a methodical eater with no sense of smell and a limited palette I normally eat one thing at a time without adding anything so that I can appreciate the texture and what little taste I can identify. But I couldn’t do that in Japan, as morsels that should be enjoyed hot would be cold by the time I got to them, if I tried to eat all the raw delicacies first (as I would normally do). So I found myself switching between pickles, exquisitely fresh, tiny squid, tofu and miso covered rice, using soy and wasabi (but not much, it’s too strong for me!) and mixing it all up together with some surprisingly tasty results. Again, I watched the other customers carefully and took cues from them, learning, along the way, that I prefer light soy and miso to dark, that bamboo and pickles and seaweed comes in many delicious forms and that raw is definitely the way to go! By the end of each meal I was ready to sleep and would fall onto my soft, warm futon in a happy food haze. Listening to the nearby river rushing past, it didn’t take me long to pass out into a deep, dreamless sleep. My ryokan and onsen experiences were two of my greatest pleasures in Japan; pleasures I would love to repeat. Crossed legged on my African cushion cover, a handmade memento from Mozambique (well, Tracey handmade it, I brought the material home!) I sit surrounded by china, wood and paper. Carefully, I cut a strip of bubble wrap, resisting the urge to pop each sphere and satisfy my inner child. For this time I must be a grown up. I select a cherished memory, a glossy cat; a silver echidna and place it lightly on the waiting cushion. Slowly, I draw the blanket of air around my past and swaddle it, tucking it up safely to sleep in a darkened box until it is time for me to reawaken it and re-examine my past. Brushing items with my fingertips I smile as I notice the blue-tac still stuck to the bottom of small china animals, the remnants of a childish period of collection. Figurines stuck to the window sill to protect them from the curiosity of Misty, the original black cat. These ‘pets’ are all that is left after periodic culls of my life. This cull is the most savage so far, yet I am unable to say good bye to sweet cat figurines, or seahorse mobiles bought to remember my adventures. I am particularly fond of my travel mementos, proof that a world exists beyond the horizon of work and sleep; reminders to look beyond my mundane existence; the reason all my possessions have to be packed away in the first place. No tears are shed, but wry smiles are a-plenty and a hollowness opens in my chest as boomerangs and bodhran disappear in a haze of air and plastic. In no time at all my fragile valuables fill a box the size of a pillow, in suspended animation until I return. The bubble wrap ends before I am able to put away everything though. I am still bound to my past even after I forget its physical form. Joy, pain and lives lived and lost still resonate within me.